Gerry had the afternoon off work today, so we went to run errands, including a flu shot. I have never gotten one, but Gerry had one last year and swore that was the reason he wasn't sick last winter. I was a bit concerned that I may have side effects with it, but so far only had a bit of a sore neck and arm- which was minimal. Plus I got to talk with the health nurse who shed some light on a few other health issues I had that I need to now approach my doctor about. Made some brownies this morning that I have to share the recipe with everyone.When I come across a good recipe, easy and not too many ingredients, I do like to tell others.This one being Jane Davis's Brownies. Easy, quick and turned out great! Erika, ( youngest daughter), was working full time casual, with her job ending soon, so she applied for a job within the company and got on full time as an Assistant Account Manager. More responsibilities, but a steady job for her and good benefits. Yesterday was Gerry's birthday, so treated him to a show in town: David James and Big River - a Tribute To Johnny Cash. 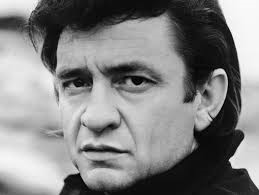 I grew up playing my dad's Johnny Cash records, plus with the Walk The Line movie, was always a big fan. The show was great and David James sure sounds like him- be sure to check out the link above and listen to the UTube video. Anyone else a Johnny Cash fan?